If you didn’t get the Wizard of Oz reference in the title, do you remember when the fab four were marching through the forest chanting “Lions and tigers and bears!”, as they made their way to the Emerald City? I love that film. I blame my mother for my love of classic Hollywood musicals … The Wizard of Oz, Singing in the Rain, Oklahoma, West Side Story, Calamity Jane, The Sound of Music … the list is long! Technically, West Side Story is a full blown opera but that’s okay because I blame my mother for my love of the opera too … and the fact I seem to have all the words to all the songs tattooed on my brain after years of exposure. My mother has always loved music and she loves to sing. So it is a blessing that she has the most amazing soprano voice. To be honest, growing up in our family sometimes felt like being in the Von Trapp Family Singers (sans all the hotfooting it over the alps to freedom … ). Listening to her singing with her brothers and sisters, is one of the great family memories I and my cousins will ever have. As a teenager, she was encouraged to be formally trained but WWII and a stern, but loving, father meant she was never able to take up the opportunity. It seems a shame, but she doesn’t seem too fussed about it. Singing is just a part of her. It’s just something she does. She is eighty one now and still sings around the house as she has always done. It is good to stop and remember some of the things that we love and appreciate about our mothers that perhaps we tend to take for granted. Of course, I appreciate my mother’s strength, the values and love she has always given me, sometimes during very trying ordeals. The way she cares for my father, now that they are both elderly. The fact she has always been my best friend. Her wisdom and commonsense, and a childlike sense of fun that belies her years. Damn, she’s a huge fan of Buffy and Firefly and even enjoys Star Trek. She is the perfect mamma for a diehard nerdy geek. But I also appreciate her passing on her love of music, of song, and the need to sing when I am happy or sad or just because … and sometimes when I don’t know why. Maybe it’s because of her. 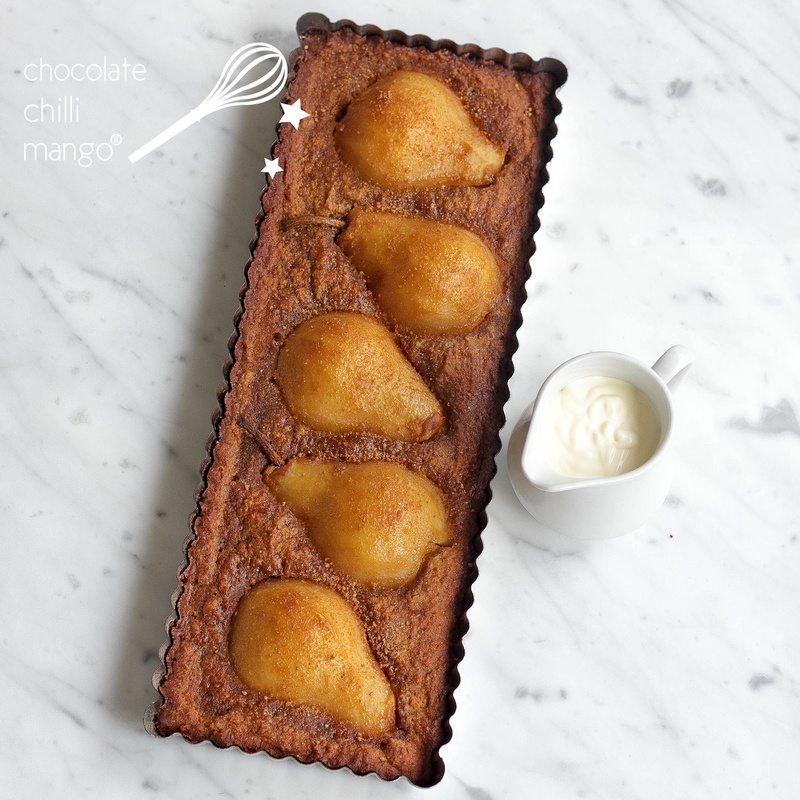 Mum also loves a pear and almond tart for Mother’s Day … it’s the perfect Autumn dessert and a long-standing tradition. 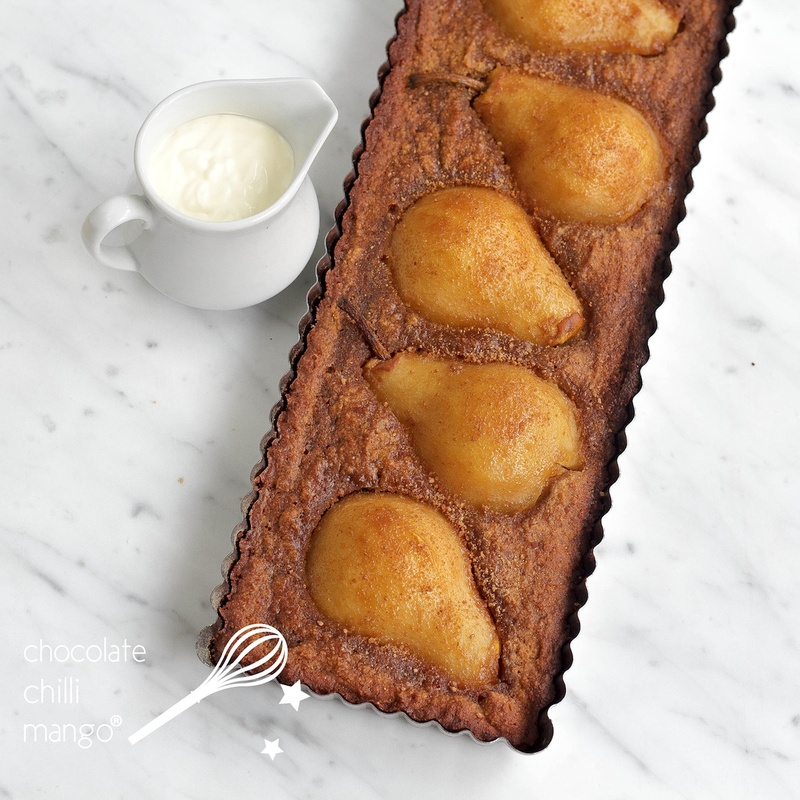 Usually, I make a pear and almond frangipane tart, or a variation with walnuts like this one. This year I made her something slightly different. This tart has no pastry shell, is quick and easy to whip up, and just happens to be gluten-free. It’s full of lovely caramelised coconut sugary toffee goodness. It’s all sticky goodness with fresh pears and caramel flavours, but is still quite light. Serve this tart at room temperature or slightly warmed with a thick or clotted cream. It would also pair well with a scoop of ice cream. Chocolate, almond, caramel, or Amaretto would be good flavour matches. Of course, a great vanilla bean gelato would be perfection. 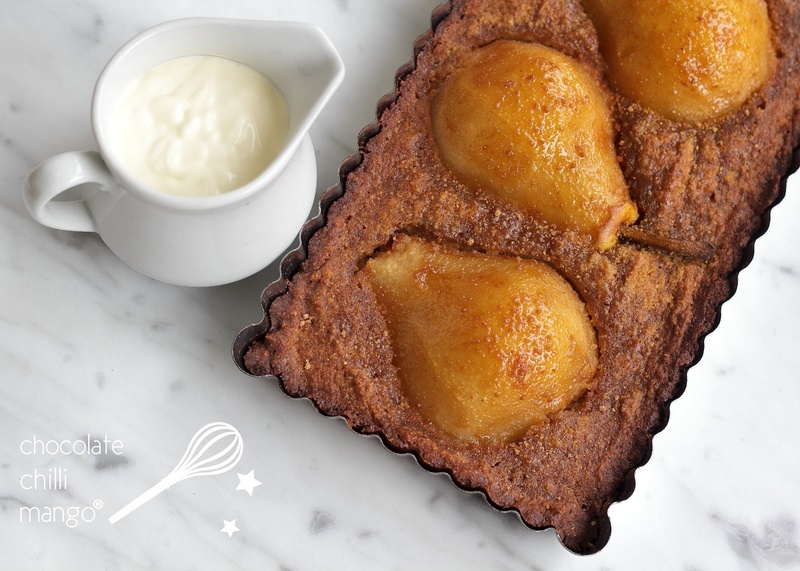 Tonight, we’ll be kicking back with a slice of pear tart and Les Misérables on blue ray. Someone is having a special night in. There may well be singing. Wishing all of you mothers out there a very happy Mother’s Day! May you be loved and appreciated every single day of every year. I love the toffee flavour that coconut sugar imparts. It caramelises so beautifully, which is important in making this tart extra special. You can, however, substitute an equivalent amount of brown sugar in this recipe. Preheat the oven to 160C. Lightly grease and line the base of a 33cm x 11cm loose-bottomed oblong tart tin. Set aside. Place the butter and coconut sugar in a mixing bowl and beat until light and fluffy. Add the eggs and beat until incorporated. Add the almond meal, coconut flour, baking powder, and lemon juice and zest. Beat until the batter is smooth. Transfer the mixture to the tart pan and spread evenly, so the top is level. Peel the pears. Halve each pear and retain the stem. Remove the inner core carefully. Place each half on the tart and gently press into the mixture. 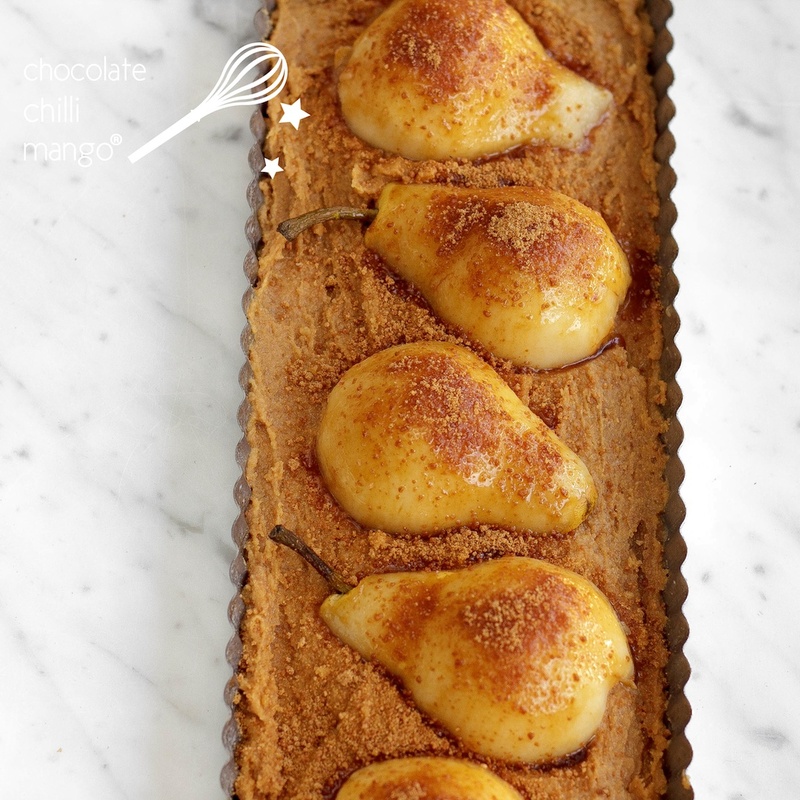 Sprinkle the pears liberally with the extra coconut sugar. Bake at 160C for about 40 minutes until cooked through. Remove from the oven and allow to cool in the tin. Sprinkle lightly with extra coconut sugar before serving. Serve warm or at room temperature, with a dollop of thick or clotted cream, or ice cream. Leftover tart will keep for a few days, if stored, covered, in the refrigerator. You can bake this tart in a square or round tart tin if you prefer.